Nissan produced the 350Z for just six short years, but these cars still remain a force in the automobile market. Earlier versions of Z cars were phased out of production especially in the U.S. market due to lackluster sales. In order to save the brand, a new car was designed and produced with a higher performance engine. The unique Fastback design proved to be a success years after the first prototype hit the market. 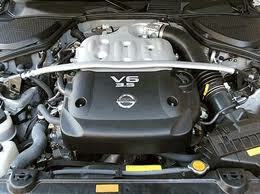 You will find Nissan 350Z engines for sale in our huge database of used motors. When you purchase our engines, you receive more than a cleaned and performance tested product. You never have to worry about start up problems after a professional or DIY installation. We go through the hard work for you before we let you make a purchase. We put our name on everything that is sold from our website and make sure you get the very best. The quality of our motors is fantastic. We know that you demand the lowest amount of miles that you can find on a used car engine. Our sale prices make it easy to save money and get the exact engine you need without the high price some dealers will charge you. The awesome V6 power in these cars is hard to match. These engines fit perfectly into standard Z models as well as the editions that were produced for special runs. The drift competitions that are held around the country often focus on the performance and high torque that Nissan has developed. The Z engine has made its way around the world in average cars and racing circuits to be a distinguished leader in the quest for speed. The additional features like a selective 5-speed or 6-speed transmission has yet to be matched by U.S. or foreign automakers. Start by completing our quote form. We double check our replacement inventory and give you the lowest price. Don’t settle for just any beat up engine you find on an auction website. Call us at 1-877-630-3873 and put the power of a Nissan under your hood. We take pride in what we sell here at carenginesforsale.com and make sure you are completely satisfied with your purchase.